Are you looking forward to the holidays? Do you want some great savings on my books? Well, I certainly want to help make it easier on your pocketbook this time of year. So, starting today (and continuing through December 11th), all my books are on sale for 25% - 50% off! 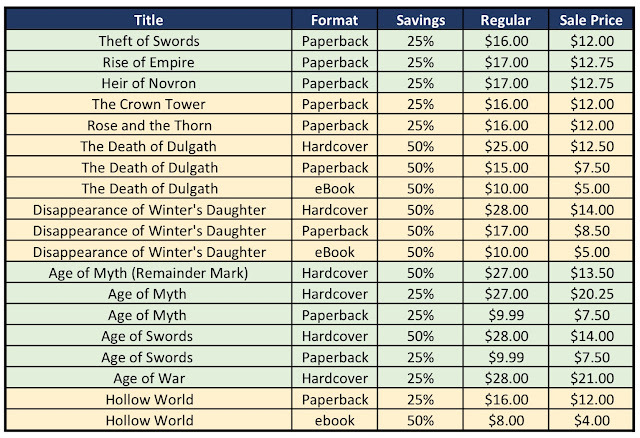 My past holiday sales have been at a 20% discount, but I have a lot of excess stock (particularly Age of Swords) and I'm deeply discounting the titles, so I don't have to pay for storage. Here are some examples of the savings you can receive. Here's a breakdown of what's on sale and the savings you'll find. And remember, all books bought from me come signed and with a custom bookmark! Oh, and one more thing...I'll throw in a free digital version of the Jester comic with each order. Now how much would you pay? Sorry, I couldn't resist. Seriously though, this is an excellent opportunity to get books you've missed to buy some presents for people you'd like to introduce to my tales. Happy Holidays! You can share info about your special offers https://paperovernight.com/blog/first-grade-paper-writing here too! It will be pretty nice for you to try that.